At elite public school Slaughterhouse, in remotest Gloucestershire, a fracking facility accidentally opens up a massive sinkhole, unleashing monsters hardly worse than those the school itself is producing — something that working-class new boy Don (Finn Cole) is discovering as he subjected to the horrific bullying of "school god" Clegg (Tom Rhys Harries). 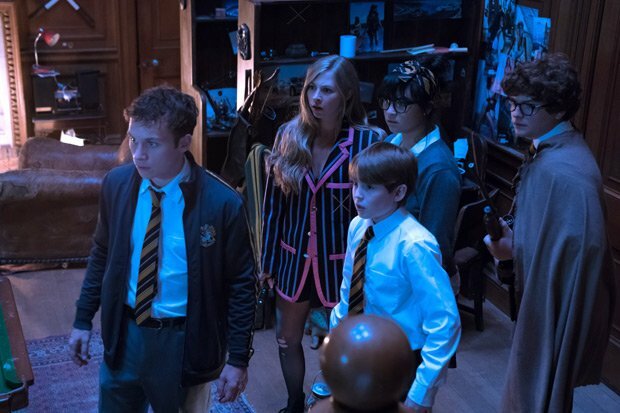 If Slaughterhouse Rulez appreciates this satirical potential, it fails to demonstrate it. The entirety of this unfunny, unscary horror comedy is a series of missed opportunities to send up sociopathic class structures and the "unelected imperialism" of fracking company TerraFrack; the head of which is the former Slaughterhouse roommate of the current headmaster (Michael Sheen). It's as if director and co-writer Crispian Mills was so afraid he might be beating a metaphor to death that he didn't bother to deploy it at all. And then, despite the apparent signposting of anti-fracking activist Woody (Nick Frost), who ominously warns of the sinkhole as "a portal, a gateway [that] leads straight to hell," there's nothing supernatural in the beasts. They're not demons, just (mostly) previously unknown subterranean animals. They're toothy and dangerous, sure, but nothing more than the stuff of a cheap, dated creature feature. Slaughterhouse isn't even cheesy: that would require some passion, which is completely lacking here. With the thinnest of plots, this is a frequently incoherent mess of a movie. Watching mean posh gits get torn to pieces should be a lot more fun than this. General release from Weds 31 Oct. In an elite public school, a fracking facility opens up a massive sinkhole, unleashing monsters. Unfunny, unscary horror comedy which misses every chance to send up its targets, wasting a fine cast on a thin plot, weak effects and a passionless approach. Watching mean posh gits being torn to shreds should be a lot more fun.